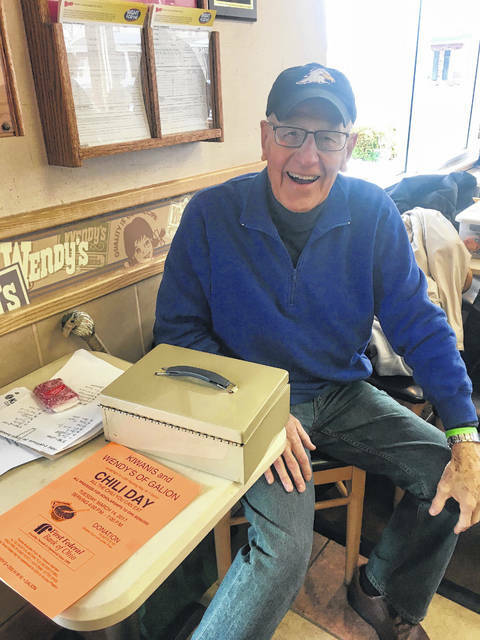 Courtesy photo Long-time Galion resident and Kiwanis member Lonnie Eagle is shown at last year’s Chili Day fundraiser at Wendy’s in Galion. The annual event will take place on Tuesday March 13 and was renamed in honor of Eagle who passed away last year. GALION — On Tuesday, March 13, Galion Kiwanis will hold it’s annual Chili Day Fundraiser at Wendy’s, 200 Harding Way West. The event takes on special meaning this year for Kiwanis members and many in the community. Galion resident Lonnie Eagle was a long time Kiwanis member and well known to many in the area. His passing last year was a loss to both his family and all who knew him. As a nod to his many years of service, the event is now call the Lonnie Eagle Chili Day. “Lonnie spearheaded the idea from the beginning,” said member Brian Treisch. Chili Day is one of three fundraisers held each year by Galion Kiwanis to help fund two $1,000 scholarships offered to Galion graduates each spring. In 2017, approximately 214 people attended. Tickets are $7 and available though any Kiwanis member. Ticket prices include all you can eat chili and drink, plus one order of small fries or baked potato. Children 5 years and under are free. Hours for the meal run from 4:15-6:45 p.m. While the event has been ongoing for more than fifteen years, Kiwanis members still look forward to participating every Spring. https://www.galioninquirer.com/wp-content/uploads/sites/38/2018/03/web1_28554707_10103521048048672_1171345963_o.jpgCourtesy photo Long-time Galion resident and Kiwanis member Lonnie Eagle is shown at last year’s Chili Day fundraiser at Wendy’s in Galion. The annual event will take place on Tuesday March 13 and was renamed in honor of Eagle who passed away last year.